A man I am proud to call my 35th great grandfather. Alfred ("elf counsel" or "wise elf") of Wessex, son of King Ethelwulf was born in 849 in Wanating (now Wantage, Oxfordshire) in the Kingdom of Wessex in what is now a part of modern day England. Now, he was greatly loved, more than all his brothers, by his father and mother—indeed, by everybody—with a universal and profound love, and he was always brought up in the royal court and nowhere else. ... [He] was seen to be more comely in appearance than his other brothers, and more pleasing in manner, speech and behaviour ... [and] in spite of all the demands of the present life, it has been the desire for wisdom, more than anything else, together with the nobility of his birth, which have characterised the nature of his noble mind. It is worth noting that he would not be known as ‘the Great’ until the sixteenth century. According to the Anglo-Saxon Chronicle at the age of four he visited Rome and Pope Leo IV and it is believed that it could be because of this visit to such a grand and religious city that he developed into a very religious man as an adult. One story suggests that he was given a coronation as a king by the pope as a preparation for him becoming the King of Wessex one day, however this is most likely not true as he was the youngest of four sons and so would have seemed unlikely to ever become king. Upon returning from Rome his father was overthrown by Alfred’s brother Ethelbald, but an agreement was quickly reached whereby Ethelbald would rule in the west of the kingdom and his father in the east. After their fathers’ death Wessex was ruled in quick succession by Alfred’s brothers; Ethelbald, Ethelbert and Ethelred. During the reign of his eldest two brothers, there is little mention of Alfred, but he re-emerges when his third brother Ethelred is on the throne. Now he begins to be described as ‘secundarius’, which could mean the king’s second in command or right-hand man. He would fight alongside his brother the king in many battles to keep the ‘Great Heathen Army’ (Vikings) out of the Kingdoms of Mercia and Wessex. In 870 the Vikings had rampaged through the other Saxon kingdoms leaving Wessex as the last kingdom standing and England’s last line of defence. On the 23 April 871 Ethelred died, making Alfred the new King of Wessex despite having two sons of his own. There is far too much information to go into in this blog post on his encounters with the Vikings, but it suffices to say that Alfred did a great job in both defeating and making treaties with the Vikings. He was also able to reclaim and restore the city of London. It is said that while hiding out in Somerset from the Vikings a peasant women offered him shelter. Whilst there she asked him to look after the cakes (loaves of bread) that she was baking, but distracted with thinking and worrying about his kingdom he accidentally let them burn. She not knowing he was the king gave him a good telling off. From 878 he would become known as the King of the Anglo-Saxons, equivalent to the King of the English. Alfred reformed his kingdom’s military including the creation of a network of Burhs (later Boroughs), fortified settlements that enabled his kingdom to be defended at a moments notice. As a part of these military reforms he greatly improved the navy (commissioning ships twice as long as Viking longboats), which some people describe as the birth of the English Navy, however Wessex already had a navy, he just made it better. Alfred was a greatly learned man who loved to learn new things and study books and writings on law, issued a domboc, a long list of law codes divided into 120 chapters. He included a scale of payment as compensation to those who had been physically hurt. The only law that could not be dealt with by payment was treachery to one’s lord, as he believed a lordship to be a sacred bond made by god for the governance of man and therefore you should love your lord as you would love the Lord Christ. Alfred was very concerned with judicial matters and insisted on reviewing any contested judgements personally. Therefore he seems to me a very foolish man, and truly wretched, who will not increase his understanding while he is in the world, and ever wish and long to reach that endless life where all shall be made clear. Alfred’s belief in learning and bettering one’s self was not reserved for himself, he set up a court school where not only were his own children and those of the nobility taught, but also "a good many of lesser birth” and set out "to set to learning (as long as they are not useful for some other employment) all the free-born young men now in England who have the means to apply themselves to it.”. Alfred married Ealhswith the daughter of a Mercian nobleman in 868 and sired five children, three girls and two boys. In 1441, King Henry VI would unsuccessfully attempt to have Alfred made a saint. King Alfred of Wessex died on 26 October 899 after having spent most of his life unwell. It is now believed by modern doctors that he may have had Crohn's disease or hemorrhoidal disease. His body was temporarily interred in Old Minster, Winchester (the capital of Wessex) and four years later it was moved to New Minster. Then in 1110 New Minster moved to Hyde and his body was moved (along with those of his wife and children) by the monks to Hyde Abbey. But in 1539 after the dissolution of the abbey during the reformation by Henry VIII, the church was demolished and the graves left abandoned. In 1788, a prison was built on the site, during the construction coffins were stripped of lead and the bones scattered and lost. In 2014, it was announced that a fragment of pelvic bone from a 1999 excavation of the Hyde site had been radiocarbon dated to the right period and could possibly be that of Alfred or his son Edward. A sad end for the remains of England’s greatest king. 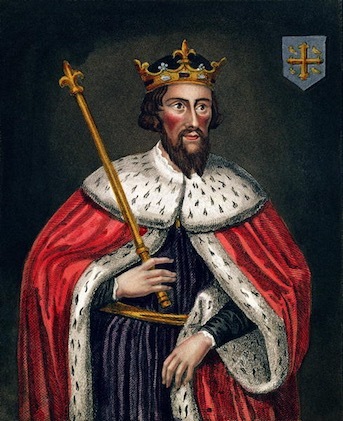 A king who defended Wessex and the other Saxon kingdoms from Viking invasions even when met with overwhelmingly negative odds, united the English and improved his kingdom’s legal and military systems, improved his people’s way of life and encouraged learning. My will was to live worthily as long as I lived, and after my life to leave to them that should come after, my memory in good works.